Jane and Vincent's sense of peril is screaming out for them to flee, but Vincent cannot stand to leave an estate connected with his family in such a condition. They have survived many grand and terrifying adventures in their time, but this one will test their skills and wits more than any they have ever encountered before, this time with a new life hanging in the balance. 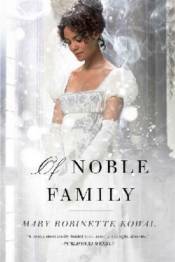 Mary Robinette Kowal'sOf Noble Family is the final book of the acclaimed Glamourist Histories.